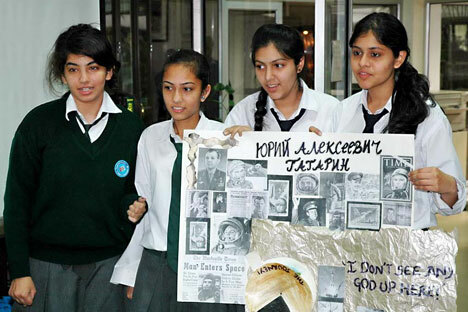 An Olympiad for Indian school children entitled “Russian Language—the First Language of Communication in Space” to mark the 50th Anniversary of Yuri Gagarin’s space flight was organized jointly by the Russian Centre of Science and Culture (RCSC), Institute of Russian Language and Delhi Schools at the RCSC on March 10. In the Olympiad, the Springdales School, Pusa Road, took the lead and won the first prize. D.P.S. Dwarka won the second prize and the Springdales School, Dhuala Kuan, the third prize. Bluebells International School received the consolation prize. The prize comprised trophies, mugs and pens. The students were divided into five teams (two teams from Springdales School, Pusa Road), and the competition was earmarked under four rounds. The first round was on wall newspaper display on Yuri Gagarin and space in Russian and English, the second round on multi-media presentation on space and Yuri Gagarin in Russian and English, the third round on the recital of two poems each on space in Russian language, and the fourth round highlighting question-answer session on Yuri Gagarin and Rakesh Sharma. The Olympiad went on successfully with the spirited participation and great enthusiasm of students, who are learning Russian language, from five Delhi-based schools—Springdales School, Pusa Road, Springdales School, Dhaula Kuan, D.P.S. Dwarka, and Bluebells International School. More than 60 students, accompanied by their teachers, were present. The Jury consisted of Dr. Girish Munjal, Director, Institute of Russian Language, Ms. Yelena S. Shtapkina, Deputy Director, RCSC, Ms. Olga Dycheva, Ms. Natalia Gileva and Ms. Ryan Akhmedova. The teachers were felicitated for their sincere initiatives and hard efforts in motivating and guiding the students.